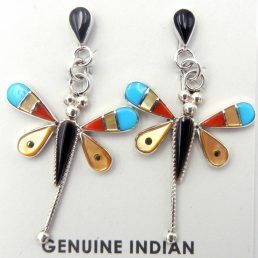 The Indians of the Southwestern were introduced to silver-smithing by the Spaniards in the 1600s. 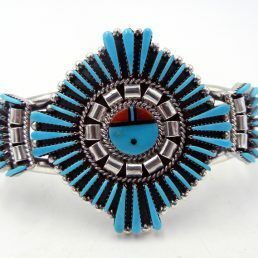 Since then, sterling silver and turquoise jewelry have become a hallmark of Navajo and other Indian nations. 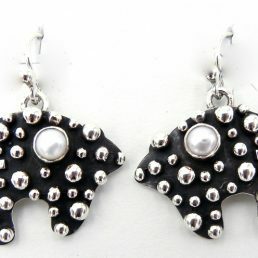 Over the years, each tribe and Pueblo have come to favor different silverwork methods and developed their own unique styles. 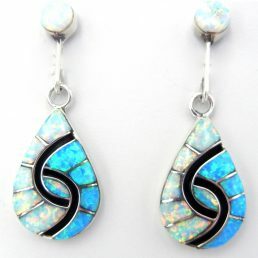 The result is an array of different sterling silver jewelry shapes, textures and finishes, all of which can be seen in the online and store collection of Native American Indian jewelry at Palms Trading Company. Tufa Casting. Tufa casting is named for the tufa stone, a soft lava rock into which a shape and some design elements of a piece of jewelry is carved. The tufa stone is not completely smooth, so the silver jewelry cast using this method is textured. Because heat degrades the tufa stone, a tufa stone mold can only be used once or twice before a new stone must be carved. Sand Casting. Sand casting uses casting sand (a mixture of dry cement and oil) to form silver jewelry. A master sample is created and a reverse mold created in the sand. The master sample is removed and filled with molten silver to create a new piece. Sand cast molds can only be used once before being discarded. Both silver casting methods are labor-intensive. 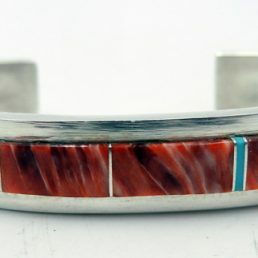 Native American Indian jewelry artists invest a great deal of time carving the stones and creating the molds to create each piece of sterling silver jewelry. The short lifespan of each mold makes it impossible to mass-produce a piece, one reason why the sterling silver jewelry in our store is so unique. 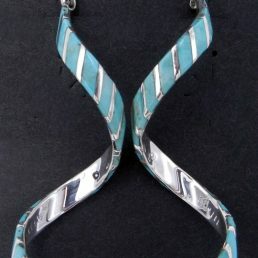 Designs in Native American Indian-made silver jewelry that are not a result of the casting process are most often created by stamping or overlay techniques. 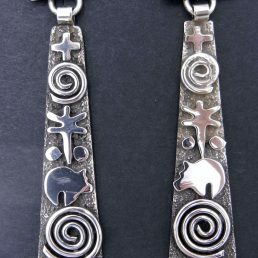 Stamped silver pieces, like those by Navajo artist Vince Platero, are hand-stamped, not created with a machine. 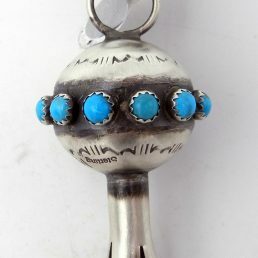 The overlay technique for which the Hopi and Santo Domingo artists are best known requires two shanks of silver—one out of which the design is carved; the other onto which the design is soldered. 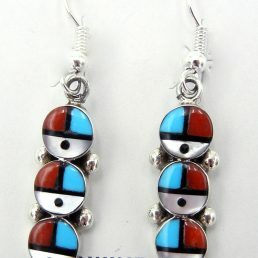 Handmade Native American Indian Jewelry. Not all sterling silver jewelry is polished to a reflective shine. Various finishing techniques give sterling silver jewelry a vintage look or amplify the depth of overlaid and carved pieces. Buffing sterling silver with steel wool instead of a soft buffing pad, for instance, results in brushed silver. Brushed silver has a matte finish, giving the silver jewelry piece and aged but not tarnished appearance. 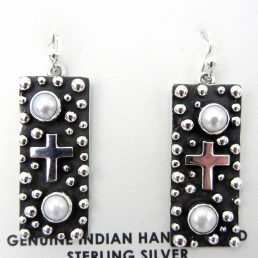 Sterling silver that is treated with a sulphur solution is called oxidized silver. Silver that has been oxidized turns black. Brushed or polished silver is often overlaid on oxidized silver because the dark background amplifies the depth of the pattern. Unlike some tarnish, the black patina of oxidized silver can be buffed away to restore a high-polished shine. Online and in our store, Palms Trading Company carries a selection of Southwestern jewelry that displays all silver casting, design and finishing techniques. If you would like to see more pieces of a particular silverwork method, our personal shopper service can help. Contact us to tell us what type of casting, design or finish you’re looking for, and we’ll do the rest!